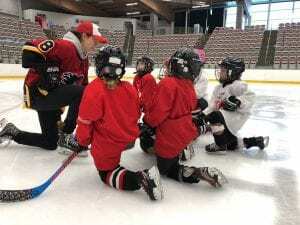 It was one of the first questions asked by one of the female hockey players to the Calgary Inferno after a two-day skills camp held in conjunction with the Grindstone Award Foundation. The question shows the impression the players and the Nov. 3 to 4 event left on the young players, but what they may not fully realize is the impact it truly leaves. “It’s just about getting the kids out and getting them to understand there are these female role models in their backyard and at the same time growing the game and raising money for financial aid for players in need,” said Grindstone General Manager Dominique Di Rocco. 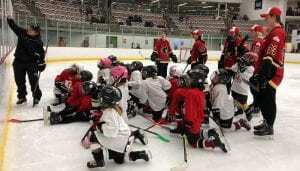 The Inferno players donated their time to put on this clinic for young female and adult women players, gave locker room tours, held yoga classes, a Hot Stove where the players answered questions and of course ran on-ice session for all female players. Funds raised through the event go back to the Grindstone Award Foundation to help with the mission to ensure no girl is left on the sidelines by awarding grants to players needing financial aid, no matter their skill level. The Inferno players left the 65 women and girls who attended the clinic with some insights into the female game. “I think for you guys, you just look up here and you can be in this spot in 15-20 years and it is totally achievable and it is only going to get better. This is just the start. It’s growing,” said Erica Kromm of the Calgary Inferno. Many of the Inferno players on the HotStove panel admitted they didn’t have many female hockey role models growing up, but they are seeing that shift. Playing in the Canadian Women’s Hockey League gives kids, like the one in attendance at the clinic, players they can related to and look up to. “There is still a lot of people that when their daughters say ‘I want to play hockey’ that the answer is ‘no, hockey is for boys so you are not going to play hockey.’” Far right. “We need to change people’s perceptions in terms of the fact that women can play hockey, they can be amazing at it and it is a very entertaining product.” It was a special weekend for many participants as most of the girls had only skated with boys, making these the first sessions ever stepping on the ice other girls. 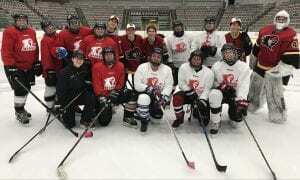 For the Women, ages 26-50, many expressed finding hockey later in life, sharing their experiences and struggle to play when they were younger. The Inferno players said the best part of the weekend was being on the ice with the girls and women, who were full of energy and smiles. The Grindstone Award Foundation will team up with the Toronto Furies for the next charity clinic on Nov. 17 at the Mastercard Centre in Toronto. On Dec. 9 our 3rd CWHL charity clinic will take place with the Markham Thunder at the Thornhill Community Centre in Markham. To register for the clinics, please visit https://grindstoneaward.ca/events/. To donate to The Grindstone Award Foundation, please visit https://grindstoneaward.ca/donate/.